Participation is free of charge but is open only to delegates registered in the Congress. 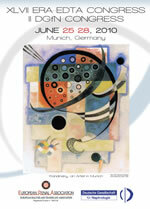 If you have pre-registered to the Congress, you can participate in the Course by simply downloading the form and send it by fax to +39-0521-959242 or by email to registrations@era-edta.org within and no later than May 25, 2010. If you haven’t pre-registered, you will have the possibility of registering onsite, first for the Congress and thus after also for the Course, directly on June 25 starting at 8.00. Admission to the Course is limited to the seating capacity of the lecture hall, thus “first come first served” basis will be applied. Course participants will be awarded UEMS credits (convertible in AMA credits). A coloured sticker will be attached to your badge at the entrance of the hall of the CME Course chosen and will entitle entrance to that course only. Proteome analysis in the assessment of renal disease. Protein profiling of urine by MALDI MS and gel-based approaches: tackling sample preparation and bioinformatics issues. Integration of large scale data sets in renal disease: Genetics-genomics-metabolomics. Approaches for linking the Omics levels.